Fall is upon us! We have cool mornings and evenings that are just right for snuggling up in flannel! We have wonderful flannels that would make great throws for those cool evenings. Our sale fabric is at $7.00 per yard. Next Tuesday it will be back to $8.00 per yard. We are preparing for our 5 County Holiday Shop Hop-Snowman Shuffle. Beginning November 29th and continuing thru December 1st. Hours will be 9-5 all three days. Passport are available for $5.00 each (day of the Shop Hop they will be $6.00) Your passport will include a coordinating applique pattern. When you complete the Shop Hop, turn in your completed passport to be eligible for the Grand Prize of 5 $50.00 gift certificates! Each shop will also give away a Gift Basket valued at $100.00. For every $20.00 (+tax) you spend you will receive an entry into the drawing for the $100.00 basket. We have received another shipment of Janome 4120QDC(B) and Janome 3160QDC(B) just in time for Christmas giving. These “little” machines are awesome to take to retreats and classes. They weigh in at only 14 lbs! The 4120 has 120 built-in stitches and the 3160 has 60 built-in stitches. 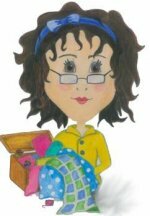 When you buy a machine from Sharynn’s Quilt Box, you will receive instructions to use the machine to its fullest. We service what we sell too. So come and see these great machines. The Swell Christmas panel from Moda Fabrics is back in stock now as requested. The panel package contains 1 large Santa measuring 52 ¼”x47 ¾”, 1 small Santa measuring 11”x10”, and a quilt label measuring 8 ½”x6”. We had these before and sold them out. Better get it while you can! October 31st – Sit ‘n’ Sew 1-4p.m. November 3rd – UFO Club 10-2p.m. November 10th – Sharynn’s Stitching Friends 9a.m. Bring Show ‘n’ Tell. Plans are in the making for our annual December breakfast. November 16th – 1-3p.m. English Paper Piecing Class taught by Carol Walp. Call the store to sign up. Only 10 “students” will be accepted.